How much is Peter Sagan Worth? 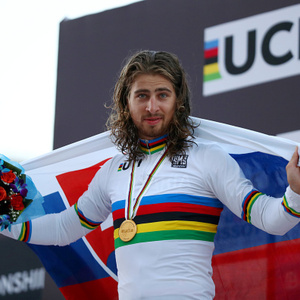 Peter Sagan net worth: Peter Sagan is a Slovak professional road bicycle racer who has a net worth of $9 million. Peter Sagan was born in Zilina, Slovakia in January 1990. He raced for Dukla Trencin-Merida in 2009, for Liquigas-Doimo from 2010 to 2014, and for Tinkoff from 2015 to 2016 before joining Bora-Hansgrohe in 2017. He was a successful junior cyclo-cross and mountain bike racer who won the Junior Mountain Bike World Championship in 2008. Sagan has won three consecutive World Championships in road bicycle racing as well as a European Championship, seven Tirreno-Adriatrico stages, two Paris-Nice stages, 16 stages in the Tour of California, and 15 in the Tour de Suisse. In 2018 he became the first rider to win the points classification in the Tour de France in his first five attempts (2012, 2013, 2014, 2015, 2016, and 2018). He also tied the record of six by Erik Zabel.